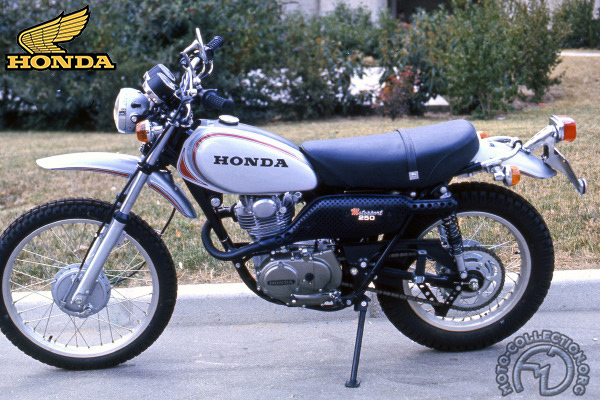 Honda belatedly produced a road-going version of its successful XR600R dirt bike. The XR650L was worth the wait. Combining the 600R chassis with the single-cylinder engine from Honda's more road-oriented NX650 Dominator brought new standards of off-road ability to the big trail-bike division. Built solely for the American market, the 650L was developed in the States on rough terrain. From the outset, Honda aimed to create a dual-purpose machine that came close to matching the performance of the off-road only XR-R. Numerous road-going parts were added, and the chassis was strengthened to cope. But essentially the 650L really was a Dominator heart in a dirt-bike body. Its engine was almost identical to the NX650's air-cooled 644cc single, with four-valve combustion chamber, slightly modified cam timing and electric starter. The steel frame was the same as the dirt bike's, apart from a little extra gusseting to handle the roadster's extra 50 lb. Suspension was a slightly stiffened version of the Rs, with sophisticated 43mm cartridge forks and multi-adjustable Pro-Link rear shock. The Honda was very tall and slim, its long-travel suspension and responsive engine making for a great city bike. But it was on the rough that the XR-L showed its ability. The thumping motor meant there was always instant acceleration on tap. The Honda's single-mindedness and high-speed vibration made it unsuited to long road journeys, but for off-road use the XR650L was in a class of it'> own. Apart from added lights and a few other road details, the XR650L was pure dirt bike.